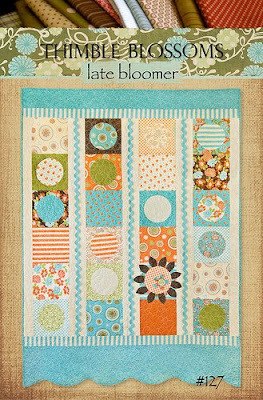 Quite appropriately, [seeing as I've just had a baby in my old age] I'm working on a quilt called Late bloomer by Camille at Simplify. I saw on someone's blog (I wish I could remember who) a technique where you cut out the circles and sew them with a very thin backing fabric, right sides together, then bag it through. I thought it would be ideal for this quilt so that I have nice circles, but can sit comfy in my chair and sew them on. Unfortunately we can't get that wide rick rack in New Zealand so I won't have that, but hopefully some plain panels will look fine. If it turns out ok then I will give it to some friends of ours that we are going to stay with in June. have you tried your local Spotlight store, as they stock some pretty wide rick rack, you may need to ask as I have noticed that different stores store it in different places, but certainly we have it in Dunedin, so if you need some e-mail me, and we can organise something I am sure.. I was going to say I've seen the wide rick rack in spotlight - but Shiree above has beat me to it lol. That is a lovely quilt pattern, I think that is a great idea about the circles - I remember seeing that somewhere too!